Caesar vs. Pompey, 49-47 B.C. Alexandrian War, 48 B.C. Caesar vs. Republicans, 46-45 B.C. Triumvirate vs. Republicans, 43-36 B.C. Augustus vs. Antony, 31 B.C. LOOKING DOWN UPON THE STREAM, HE STOOD AWHILE DEEP IN THOUGHT. When Caesar crossed the Rubicon into Italy with his army, in defiance of the Senate in Rome, he launched a Civil War between his own party, the populares, who supported a dramatic reform of Roman Government under the leadership of Caesar, and the optimates, or republicans, who wanted power to remain in the hands of the Senate. The leader of the optimate cause was Pompey, a former ally of Caesar, and the war is sometimes called the "Civil War between Caesar and Pompey", but that misrepresents the full scope of the war. It was fought over two decades, in Spain, Greece, Africa and Italy, and continued long after the death of both of its most famous protagonists. The leaders of the opposing sides were fighting for differing visions of Roman Government: popular reform on the one hand, and the maintenance of republican principles on the other. Many senators were corrupt, but others were driven by principled opposition to the abuse of dictatorial power. Pompey, in fact, refused entreaties by Caesar to co-rule with him, although they had been allies in opposition to the optimates in the past. Other Romans who opposed Caesar included scions of the most famous names in Roman history, including Cato, Scipio, Brutus, and Cicero. The war did not end either with the death of Pompey after the battle of Pharsalia, or even with the assassination of Caesar in 44 BC The republican cause was dealt a severe blow at Philippi several years after the death of Caesar, but was not entirely extinguished for many more years, as the sons of Pompey were able to raise a navy and continue the fight from Sicily. The final phase of this war was fought long after the republican cause was lost, between Octavius and Antony at the battle of Actium. This campaign, however, was between two contending emperors, neither whom represented either the populares or the optimates. Both parties had been subsumed into an entirely new form of government, led by a Caesar and run by the military, which would control the empire for then next four centuries. Julius Caesar vs. Pompey : 49-47 B.C. Caesar was so popular within Rome and the surrounding areas that instead of raising an army in Italy, many of the leaders of the optimates fled to the provinces. The Roman navy was mostly under the control of the optimates, so they were able to set up strongholds in Africa, Spain, and Greece and maintain control of the seas. Caesar was received in Italy without significant resistance, and his first action was to march into Spain, where he easily put down the republican government. Pompey's commander in Spain was Varus and he fled to Africa, where he joined forces with King Juba of Numidia, a ally of Pompey. Caesar sent Curio, one of his generals with an army to pursue Varus into Africa, while he himself returned to Italy. The Caesarean army in Africa at first had a great victory at Utica, but shortly afterward were cut to pieces at the battle of Bagradas. This left Africa in the hands of the optimates, and Utica became the stronghold of the Cato the Younger, and Metellus Scipio, two of the republican generals. The Caesareans also lost an important naval battle in the Adriatic, which complicated Caesar's plan to invade Greece and meet Pompey in battle. Undaunted, he launched a small army from Italy, and landed in Epirus. Pompey however, refused to give battle even though Caesar's army was unprovisioned and did not have reliable naval support. 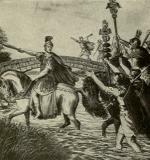 Caesar attempted to force a battle by surrounding Pompey's camp at Dyrrachium but was driven off, with significant loss. He then retreated to Thessaly, and there received reinforcements from Marc Antony. Caesar's army was no more than a third the size of Pompey's but they were tried and dedicated "picked" troops and when the battle of Pharsalus was finally fought, they were completely victorious. This city was besieged by Ceasarean army and navy in the summer of B.C. 49 when they refused to open their gates to the conqueror. Caesar left the siege to be conducted by his generals while he marched to Llerda. The town surrendered after a naval battle. In June of B.C.49, Caesar led his army into Spain to confront several legions loyal to the republicans, led by Afranius, and Varro. Instead of engaging in a pitched battled he surrounded the legions, and forced them to surrender. Fought B.C. 49 between the Pompeians, under Varus, and the Caesarians, under Curio. Varus sallied from his entrenchments to attack the Caesarians, but was signally defeated, his troops fleeing in disorder, and opening the way for the occupation of Utica by Varus. Fought B.C. 49, between the Caesareans under Curio and the Numidians under Juba and Saburra, who adhered to the fortunes of Pompey. The Roman cavalry was cut to pieces, before the legionaries could come to its assistance, and eventually the Romans were surrounded, and cut down to a man, Curio being amongst the slain. This victory left the Pompeians masters of Africa. Fought B.C. 49, when the Caesarian fleet under Dolabella was totally destroyed by the Pompeian fleet under Marcus Octavius. This victory cut off the Caesarian army under Caius Antonius, which was quartered on the island of Curicta, and Antonius was forced to surrender. Fought B.C. 48, between the Caesarians, under Julius Caesar, and the Pompeians, under Pompey. The latter having formed an entrenched camp some distance from Dyrrachium, Caesar interposed his army between the camp and the town. This interrupted Pompey's communications, and he, in consequence, attacked the Caesarian lines, which he forced, at the cost of 1,000 men, and obliged Caesar to retire. Fought August 9, B.C. 48, between the Pompeians, 60,000 strong, under Pompey, and Caesareans, 25,000 strong, under Caesar. The Pompeian cavalry drove back that of Caesar, but following in pursuit, were thrown into confusion by the legionaries, whereupon they turned and fled from the field; the infantry followed and the battle became a rout, in which 15,000 Pompeians, and only 200 Caesareans fell. After the battle, 20,000 Pompeians surrendered. Fought B.C. 47, between the Pompeian fleet, under Marcus Octavius, and the Caesareans, under Publius Vatinius. The Caesarean fleet consisted of merchant vessels, temporarily equipped with beaks, but Vatinius, though his ships were inferior both in number and quality, boldly attacked the Pompeians, and after severe fighting, completely defeated them, compelling Octavius to abandon the Adriatic. Scribonius Curio † General who fought for Caesar at Utica and Bragradas River. dolabella Roman General who changed sides several times in the civil war. Fought for Caesar at Pharsalus. varrus Roman governor of Africa. Sided with Pompey in the civil wars. Died at Munda. juba King of Numidia who sided with Pompey in the civil war. Killed at Thrapsus. Alexandrian and Bosporean Wars : 48-47 B.C. The battle of Pharsalus was fought in the summer of 48 BC The rest of the year was taken up by Caesar in two diversionary wars, only tangentially related to the ongoing conflict between the Caesarean and Republican parties. These were, the Alexandrian war in Egypt, and the Bosporean War in Asia Minor. After the battle of Pharsalus, Pompey fled to Africa, intending to join forces with Cato in Utica. He stopped first in Alexandria, however, and was murdered by the forces of Ptolemy XIII, who was currently engaged in a civil war with his sister Cleopatra. Caesar pursued Pompey, still hoping for a reconciliation, and was horrified, instead of pleased to be presented with the head of his enemy. He soon after took sides with Cleopatra in the Egyptian civil war, and began an affair with the young queen. Meanwhile, a rebellion was brewing in the Bosporus regions bordering the Black Sea. Pharnaces II, the son of Mithridates took advantage of the ongoing civil war to bring Colchis and Armenia under his control, believing the Romans were too preoccupied to stop him. He defeated a Roman army at Nicopolis, and regained Pontus, his father's old kingdom. Caesar, however, immediately marched upon Pontus and forced a battle at Ziela, where Pharnaces was utterly routed. It was after this battle that Caesar sent his famous message, "Veni, vidi, vici" (I came, I saw, I conquered). After these campaigns Caesar returned to Rome, and did not take up the war against the Republicans for another year. Fought summer of B.C. 48 between a small force of Romans under Caesar on behalf of Cleopatra, against the Egyptian forces of Ptolemy XIII. Cleopatra's cause prevailed and her brother and rival was drowned. Ptolemy XIII King of Egypt who contended with Cleopatra for the throne. Deposed by Caesar in Alexandrian War. Pharnaces II Son of Mithridates. Annexed territories around the Black Sea. Fought Caesar at Ziela. Domitius Calvinus Roman General who fell to Pharnaces II at Nicopolis. Julius Caesar vs. Republicans : 46-45 B.C. At every victory, Caesar had offered terms of the greatest leniency and at all times tried to reconcile his enemies. Still, an opposition force that refused to submit it his authority held out for several years at Utica in Africa. It was not until 46 BC that Caesar launched an expedition to Africa, and at Ruspina, met Labienus, one of his old generals, who had deserted to the republicans. Labienus had a much larger army and defeated Caesar with great loss. Undaunted, Caesar called up more legions and a few months later, met the Republican army, this time led by Metellus Scipio, at Thapsus. This was an enormous battle, far bigger than Pharsalus, and hard fought. The republican forces were routed, Scipio died in battle, and Cato the Younger famously committed suicide rather than submit to Caesar. Still the republicans were not vanquished. Labienus had fled to Spain to join forces with Varus and Gnaeus, the elder son of Pompey, and there induced several republican legions, who had reconciled with Caesar after Pharsalus, to desert. Spain was back in the hands of the republicans, and Caesar's final battle, at Munda, was another colossal affair involving dozens of legions and tens of thousands of casualties. Varus and Labienus were killed and Gnaeus was wounded, but Sextus, the youngest son of Pompey escaped to Sicily. Fought January 3, 46 B.C., between Julius Caesar, with three legions, and a force of Pompeians, composed entirely of cavalry and archers, under Labienus. Caesar's troops were surrounded, but behaving with extreme steadiness, were able to retire to Ruspina in good order, though with very heavy loss. Fought March 17, B.C. 45, between the Pompeians, under Cnaeus Pompeius, and the Caesareans, under Julius Caesar. The Pompeians were totally defeated, losing 30,000 men, including Labienus and Varro, while the Caesareans lost 1,000 only. Cnaeus Pompey was wounded. This defeat put an end to the resistance of the Pompeian faction in Spain, and the action is further notable as being Caesar's last battle. Cato (the younger) Highly principled republican who opposed Caesar, killed self after defeat of Pompey. Metellus Scipio † Leader of the Republican resistance in Utica. Led Republican army at Thapsus. Cnaeus Pompeius † Eldest son of Pompey. Led Republican forces at Munda. Titus Labienus † Caesarean General who defected to the Republicans. Fought at Thrapsus and died at Munda. Varrus † Roman governor of Africa. Sided with Pompey in the civil wars. Died at Munda. Juba I † King of Numidia who sided with Pompey in the civil war. Killed at Thrapsus. Second Triumvirate vs. Republicans : 43-36 B.C. HERE, SHELTERED BY STEEP CLIFFS, HE SAT DOWN TO REST. The idea of a republican government still lurked in the hearts of many, even after their crushing defeat at Munda. Two years after his final victory, Caesar was assassinated by Republican sympathizers, and a new phase of the war broke out. Immediately after the death of Caesar, there was a complicated realignment of forces. For a time Octavius, the heir of Caesar, appeared to side with the republicans against Antony, who remained faithful to Caesar's cause. The two met first at Mutina, but after that indecisive battle, they joined forces to form the second triumvirate. The triumvirate was openly anti-republican, so Brutus and Cassius, who had master-minded the assassination of Caesar, fled to the east where they raised armies. Octavius and Antony then raised an army and met Brutus and Cassius at Philippi. There were two separate battles several miles apart. The results of the first battle were mixed, but Cassius, fearing a total loss, committed suicide. In the final battle, however, the Republicans were utterly defeated. Brutus and several of his officers also committed suicide. This was an enormous set back for the Republicans, but still some resistance lingered on. The republic still had a formidable navy, and a base of operations under Sextus Pompey in Sicily. This final bastion of republican resistance to was not vanquished until 36 BC when Octavius sent his best general, Agrippa, against Sextus Pompey at the battle of Naulachus. Fought April 16, 43 B.C., between the adherents of Antony, and three Consular armies, under Hirtius, Octavius, and Vibius Pansa. Antony, who was besieging Mutina, was attacked simultaneously by the three armies. That of Pansa was routed, and Pansa slain but Octavius and Hirtius gained some small success. Antony, however, was undefeated, and continued the siege. On the 27th Octavius and Hirtius made a combined attack on his lines, and succeeded in forcing their way through into the town, though Hirtius fell in the action. Fought B.C. 42, between the Republicans, under Brutus and Cassius, 100,000 strong, and the army of the Triumvirs, about equal in numbers, under Octavius and Mark Antony. Brutus on the right repulsed the legions of Octavius, and penetrated into his camp. Cassius, however, was overthrown by Antony, and would have been overwhelmed but for the arrival of aid from the successful right wing. The action was renewed on the second day, when the Triumvirs were completely victorious, and the Republican army dispersed. Brutus committed suicide on the field of battle. Fought B.C. 36, between the Pompeian fleet, under Sextus Pompeius, and the fleet of the Triumvirs, under Agrippa. The Pompeians were defeated. Fought September 3, B.C. 36, between the Pompeian fleet of 300 ships, under Sextus Pornpeius, and the fleet of the Triumvirs, of equal strength, under Agrippa. The action was severely contested, but in the end Agrippa was victorious, and Pompeius fled with 17 vessels only. Antony With Octavius, led empire after Caesar's death. Liaison with Cleopatra caused downfall. Augustus Caesar First emperor. Reigned for over fifty years. Established the Imperial system. Cassius Mastermind of conspiracy to assassinate Caesar. Committed suicide at Philippi. Marcus Brutus Leader of conspirators to assassinate Caesar. Committed suicide at Philippi. Sextus Pompeius † Youngest son of Pompey. Fled to Sicily after Munda and held out until for several years with a republican Navy. Agrippa Most trusted general and advisor of Augustus Caesar. Married Augustus's daughter Julia. Augustus Caesar vs. Mark Antony : 31 B.C. Although the Republican cause was lost, there still remained the rivalry between Octavius in the west, and Mark Antony in the east, to put to rest. The relationship between the two triumvirs was strained from the beginning, but it worsened when Octavius repudiated his wife (the daughter of Antony's wife Fulvia), in order to marry another woman. Fulvia was so incensed by this that along with Antony's brother Lucius, she attempted to raise a rebellion. Her forces were besieged by Octavius in Perusia, she was sent into exile and died shortly thereafter. This opened the door to another reconciliation between Antony and Octavius—this time their partnership was sealed by Antony's marriage to Octavia, the sister of Octavius. Lepidus had died also, so Octavius was given command of the West, while Antony reigned over the eastern empire. It was ten years before the two met again in battle, but the relationship became severely strained when Antony left his family in Rome to live for several years in Egypt with Cleopatra. He did not so much lose his empire by force as by abandoning his responsibilities and giving himself over to pleasure. His armies in the east were more than a fair match for those of Octavius, but when the contention broke into open war at Actium, he deserted the conflict in mid-battle to sail back to Egypt. Pursued there by Octavius, he committed suicide, and Cleopatra followed him in death shortly after. By this time, Octavius, now Augustus Caesar, had consolidated power in Rome, and was in effect, if not yet in name, the first Roman Emperor. The battle of Actium was followed by a long period of peace and prosperity within the empire, and the family of the Caesars continued to rule the empire for the next hundred years. This city was besieged in B.C. 41 by the forces of Octavius. It was the stronghold of Lucius Antonius, and Fulvia, the brother and wife of Mark Antony, who had tried to raise a rebellion against Octavius during Antony's absence in the east. The town was taken, and Fulvia died in exile, but Lucius was freed. Fought September 2, B.C. 31, between the fleet of Antony, 460 galleys, and that of Octavius, about 250 sail, but much lighter and less well manned than those of Antony. The battle was fiercely contested, with varying fortune; but at a critical moment Cleopatra ordered the Egyptian admiral to make sail, and with 60 galleys withdrew from the fight. She was followed by Antony, and his fleet, discouraged by his flight, surrendered after ten hours' fighting. The Octavians captured 300 galleys, and 5,000 Antonians fell in the action. A few days later Antony's land army of 120,000 men laid down their arms. Fulvia Wealthy and scheming Roman matron. Married to Clodius, then to Mark Antony. Enemy of Cicero. Lucius Antonius Brother of Mark Antony who conspired with Fulvia to rebel against Octavius. Caesar paused on the banks of the Rubicon.